A consistent approach to defining and measuring quality and to collecting information. Be clear and consistent about how we assess the quality of care across different types of service. A standardised framework with a standardised rating system could have been an immense leap forward in healthcare standards and trust in CQC inspections. Unfortunately it has an Achilles Heel that undermines the concept of comparability of the rating system. The inspection is not designed to achieve an objective, measurable and replicable audit. It is impossible for an individual provider or even an expert independent auditor to carry out a self-assessment using these documents, and guarantee that the inspector will also come to the same conclusions. The “measurements” are frequently subjective measures such as whether you have been innovative enough, or have set yourself apart from similar providers. So in theory, a provider could be ‘outstanding’ but as soon as all others achieve the same standard, you are automatically demoted to the ordinary ‘Good’ status. As before, when it comes to the dividing lines between Good Vs Outstanding, to a large extent you are at the mercy of the inspector of the day. Safety: We have used the learning from our inspections to strengthen a number of elements of safety, including recruitment practices, safeguarding, discrimination, medicines management, information sharing and management, and responding to external alerts and reviews. Leadership (Well-led): In strengthening our assessment of well-led, we are clear that there is a demonstrable link between leadership, culture and the delivery of safe, high-quality care, and our focus on well-led is intended to support and reinforce this link. The document speaks of light touch Provider Information Requests, by not asking for policies and intelligence before the inspection visit, however, this entire chapter only applies to Acute Trusts, and not to the vast majority of providers out there. 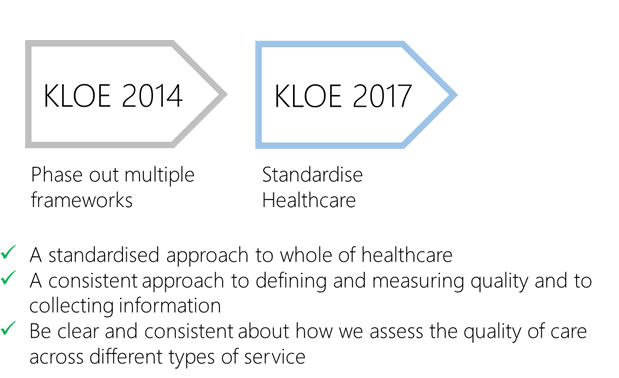 The new KLOEs include 6 themes that the CQC have deemed necessary to improve on, based on their experiences. Effectively this is just a summary of which sections contain new KLOEs. The emphasis here is that you will be asked to show continuous improvement.